Yup, that’s me. 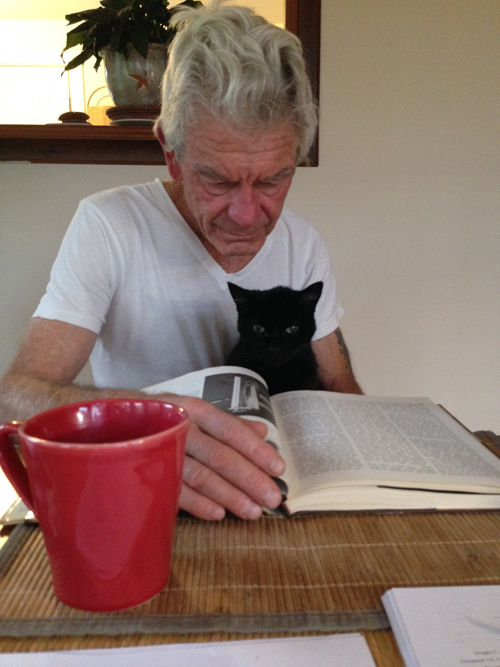 Our black cat named Two prefers my husband, Hank any day, any time, except when he’s not around, of course. I’ve learned to accept it. Actually, right now as I write this post, Two is sitting on my lap. It is morning. I am drinking coffee. Usually, Hank is sitting across the table with the cat on his lap, but he’s away. So, I guess I’m good enough. We found Two nearly ten years ago at the Taos Feral Feline Friends shelter run by Leanne Mitchell. Two wasn’t feral, but declawed by a previous owner — a cruel thing to do to a cat — and relegated to the old and fat room. (There are no cages at this shelter, just rooms in the Mitchell home.) The cat came right up to me. I told Hank this is the one. He chose to look around a bit, a fact I remind the cat from time to time to no avail. Leanne gave us a bit of the cat’s history and also her real name, Dusty. We decided to name her Two because she reminded us of our two best cats, Amos and Lewis. Her full name is Dusty Two Cats. Two settled in rather quickly. We discovered she is a talker. I’m not really nuts, but she can say, “no” and “I don’t wanna” — Hank can’t get her to say “yes” — and knows what “out” and “eat” means. And she took to Hank, largely, I believe, because I was working and he was home. Also when he had surgery, she stuck to him like his little nurse. Two and I have our things. She will go a bit nuts on me with play biting and swats when I rub her down. When we drove 2,400 miles from New Mexico to Western Massachusetts this summer, she was glued to my lap almost the entire trip. Of course, I make sure she has enough food and fresh water all the time. And right now, she’s still on my lap. But I’ve learned you can’t make a cat do what she doesn’t want to do. It’s strictly on her terms. But, no surprise here, she dumped me as soon as he returned. I wasn’t hurt. It’s just the way things are with this cat. ONE MORE THING: Thanks to the owners and authors of Crooked Cat Publishing for making me feel most welcome. For this who missed the last post, Crooked Cat will be publishing my mystery, Chasing the Case in May or June. Yes, given this post, I recognize the irony in the publishing house’s name.